Turkey pieces marinated in lemongrass, ginger and red chilli before being cooked with beansprouts, red pepper and fresh coriander. Cut the turkey into 1cm strips and season with salt. Bruise the lemongrass with the back of a knife. Peel and grate the ginger. Mix together the coconut milk, chilli powder and the ginger. Add the lemongrass to the marinade and then add the turkey pieces and leave to marinade for 1 hour. Wash and peel the red pepper. Remove the seeds and then cut the pepper into thin slices. Sort the beansprouts, discarding any that have browned. Wash and pick the coriander and then roughly chop the leaves. Peel and thinly slice the onion. Heat a wok to hot and add a drizzle of oil. Add the marinated turkey to the pan and cook for 3 minutes. Remove the turkey from the pan. Add the onion and the pepper to the pan and allow to soften before adding the beansprouts to the pan. Cover and cook for 2 minutes and then return the turkey to the pan. 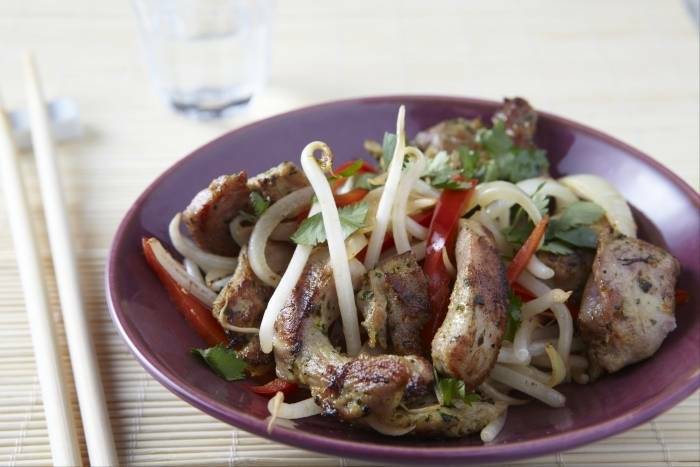 Serve the stir fried turkey with a generous handful of fresh coriander.